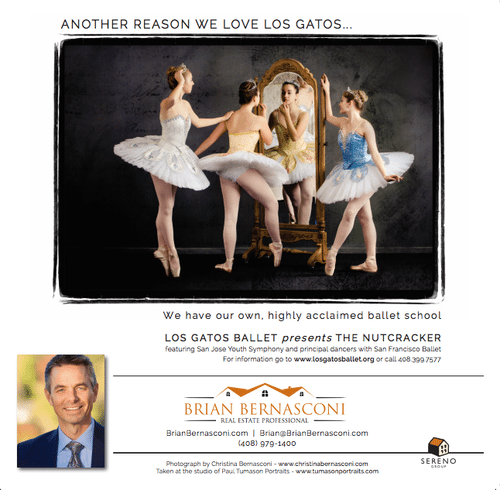 This week we ran a “collaboration ad” in the local Los Gatos Weekly newspaper highlighting the fact that right here in little ol’ Los Gatos we have our very own premiere ballet school, Los Gatos Ballet. The timing for this was very intentional in that we were also able to bring attention to their upcoming production of The Nutcracker running December 5 -7 of this year. For this ad we used a photograph taken by my wife, Christina Bernasconi who is an outstanding, local portrait photographer who had the good fortune to work with fellow photographer Paul Tumason in his studio. And the “models” of course are Los Gatos Ballet students who will be featured in the performance of The Nutcracker. Advertising in my business (any business) is essential. I just love the idea that I can advertise my business by shining a spotlight on three other business in addition to three talented young people all at the same time. This is what I call a WIN WIN WIN.